Following the rule changes announced in Romania it has been announced that that Maritimo will be back in Class 1 in 2009. The rule changes are focussed on reducing costs, improving the level of competition amongst the teams and broadening the level of entry of boats into the Championship. Bill Barry-Cotter confirmed that Maritimo Offshore will be fielding a two-boat entry. The welcome news for the Championship comes on the back of the Australian team supremo's recent visit to the Romanian Grand Prix, to attend the meeting where the WPPA announced sweeping changes to the rules for 2009, something that Barry-Cotter has been championing for some time. 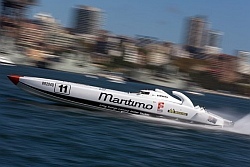 In line with the rule changes regarding the eligibility of new builds being allowed into the championship based on the same power-to-weight ratio as existing boats, Barry-Cotter will unveil and run his new Maritimo design in Dubai, with Tom Barry-Cotter and Pal Virik Nilsen, the 2008 Australian Superboat Champions, given a wild card entry to compete in the two final races of the season. Barry-Cotter confirmed that the team will run their lighter 4100kg fibreglass-built hull with 790hp V8s in Dubai, with the team also running a 4800kg minimum weight hull in 2009 with V12s.